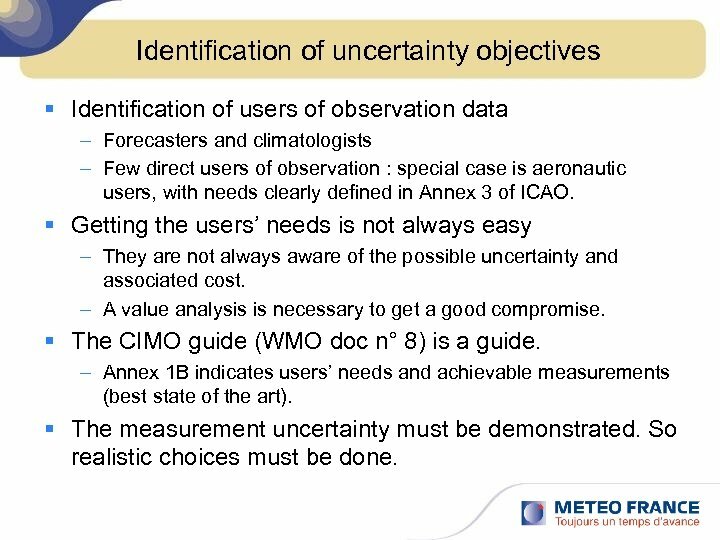 Identification of uncertainty objectives § Identification of users of observation data – Forecasters and climatologists – Few direct users of observation : special case is aeronautic users, with needs clearly defined in Annex 3 of ICAO. 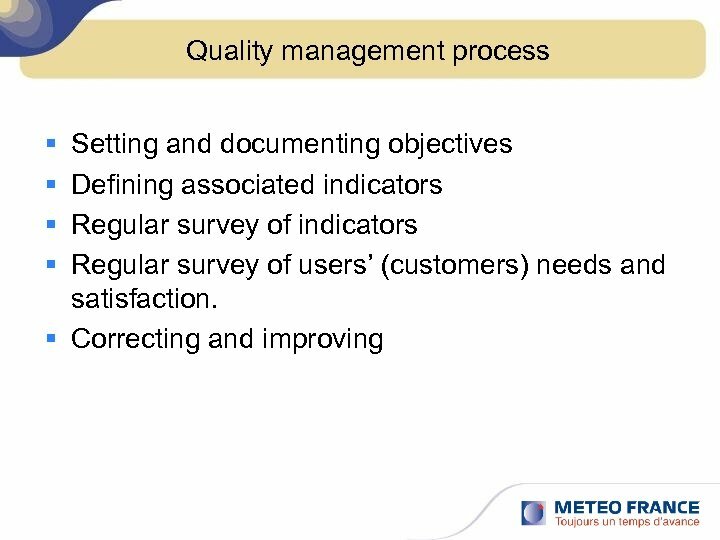 § Getting the users’ needs is not always easy – They are not always aware of the possible uncertainty and associated cost. 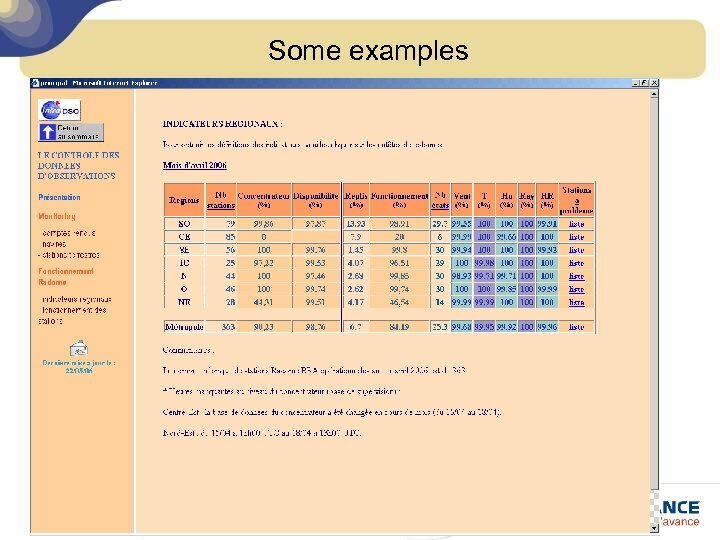 – A value analysis is necessary to get a good compromise. 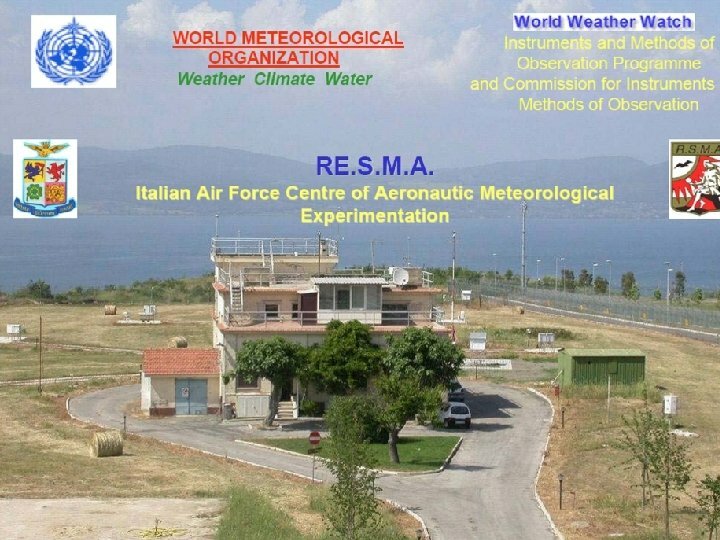 § The CIMO guide (WMO doc n° 8) is a guide. 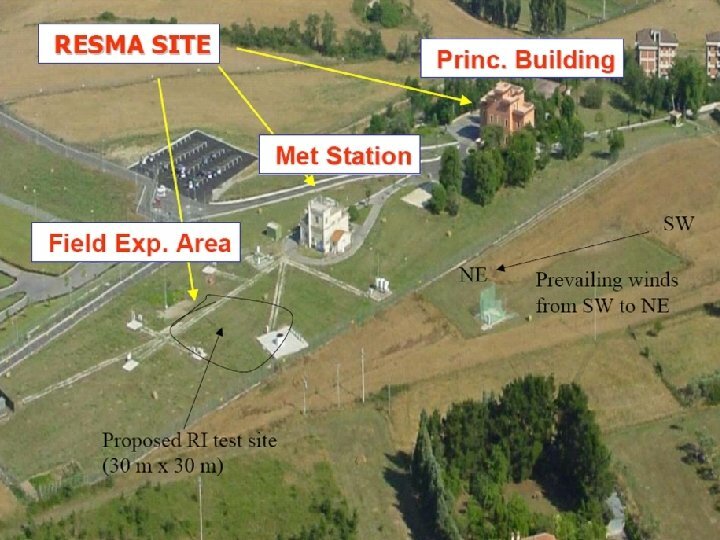 – Annex 1 B indicates users’ needs and achievable measurements (best state of the art). 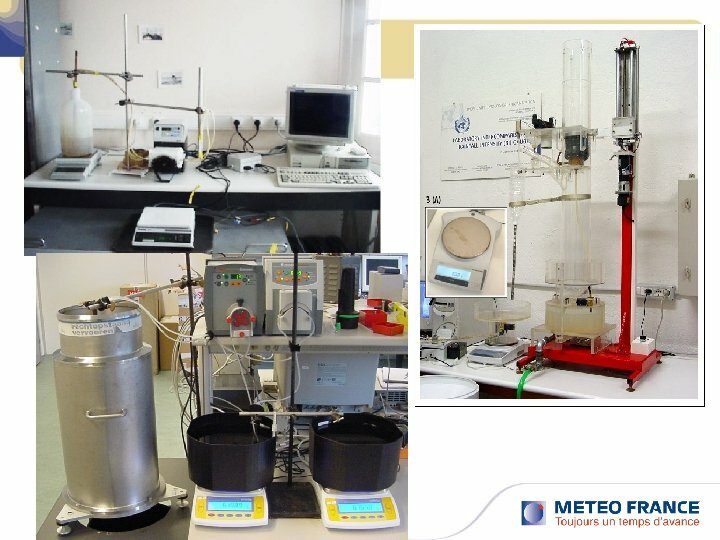 § The measurement uncertainty must be demonstrated. So realistic choices must be done. 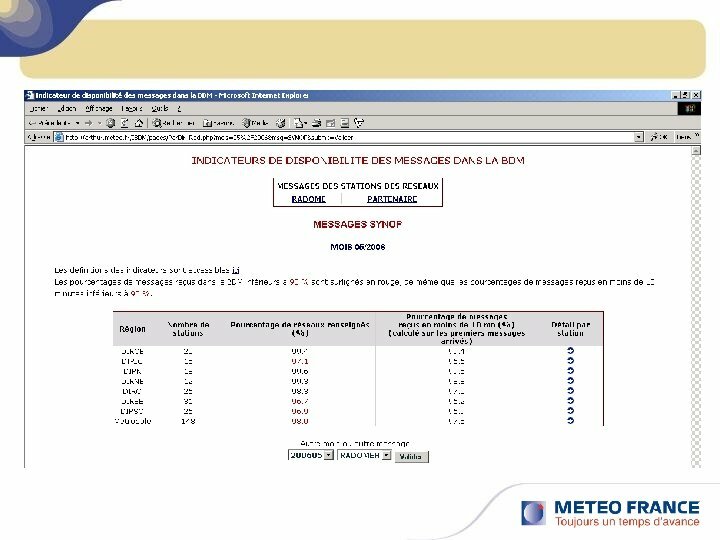 An example § For his proprietary Radome network, mainly dedicated for real-time observation, Météo. 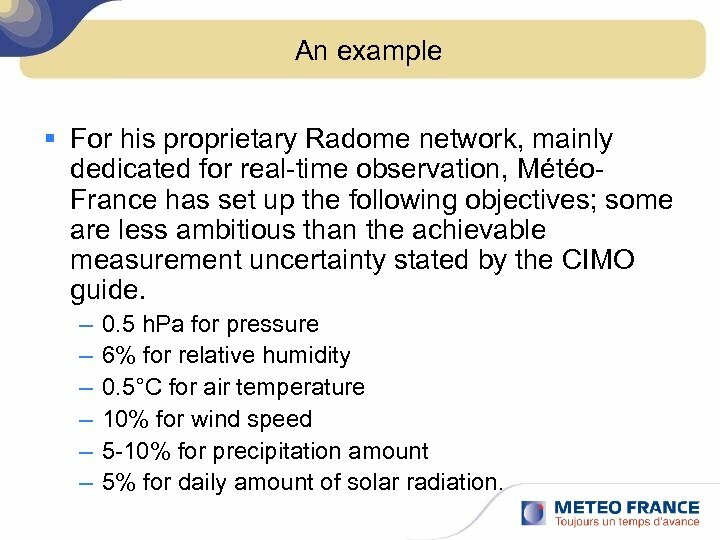 France has set up the following objectives; some are less ambitious than the achievable measurement uncertainty stated by the CIMO guide. 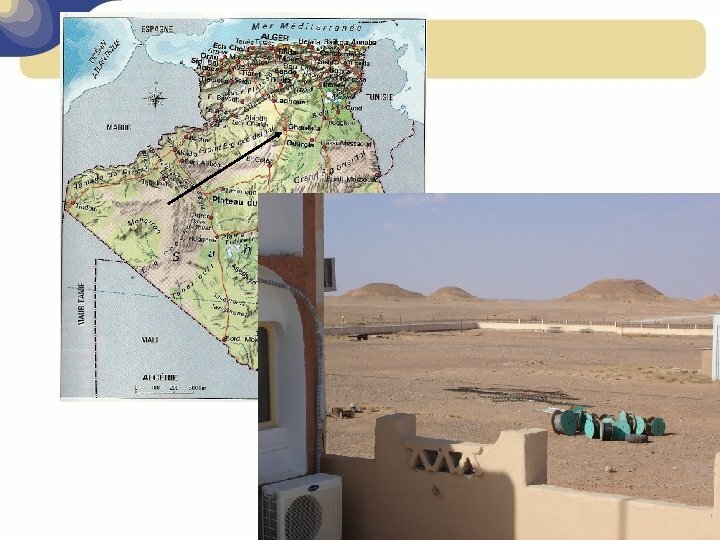 – – – 0. 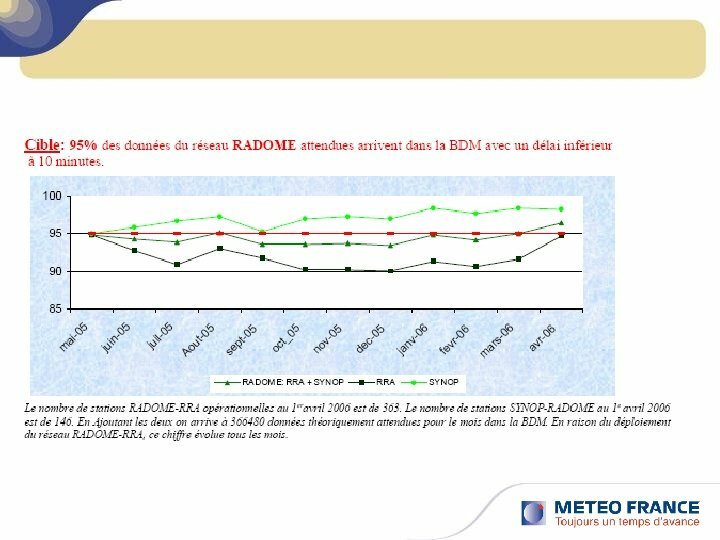 5 h. Pa for pressure 6% for relative humidity 0. 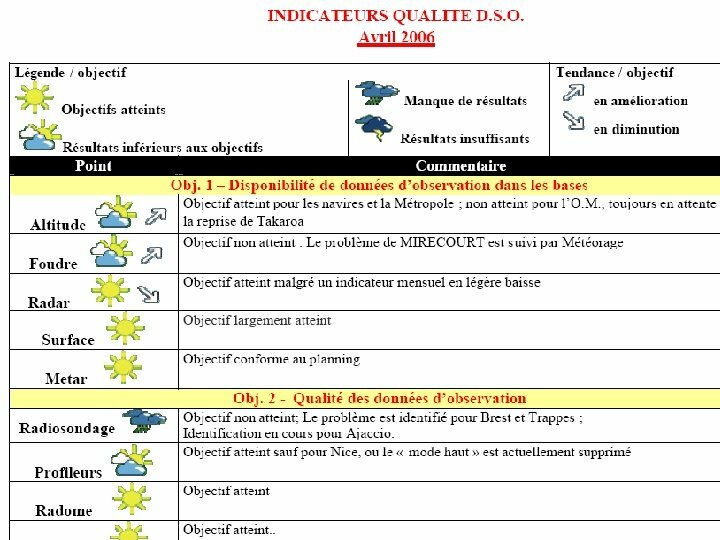 5°C for air temperature 10% for wind speed 5 -10% for precipitation amount 5% for daily amount of solar radiation. 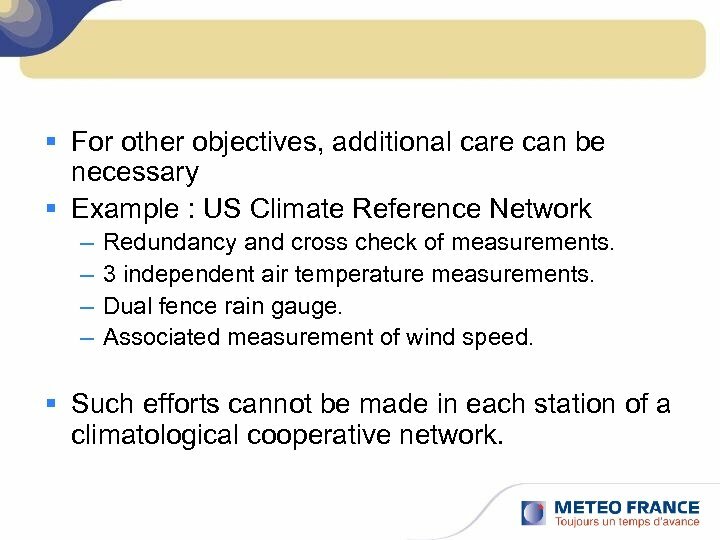 § For other objectives, additional care can be necessary § Example : US Climate Reference Network – – Redundancy and cross check of measurements. 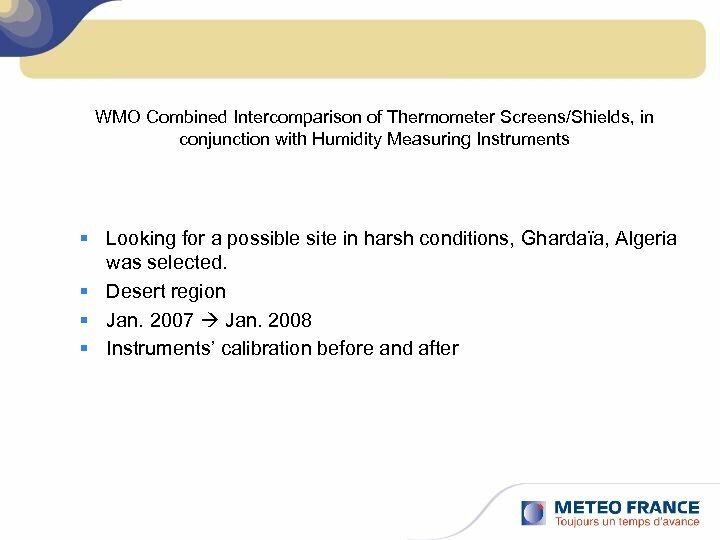 3 independent air temperature measurements. 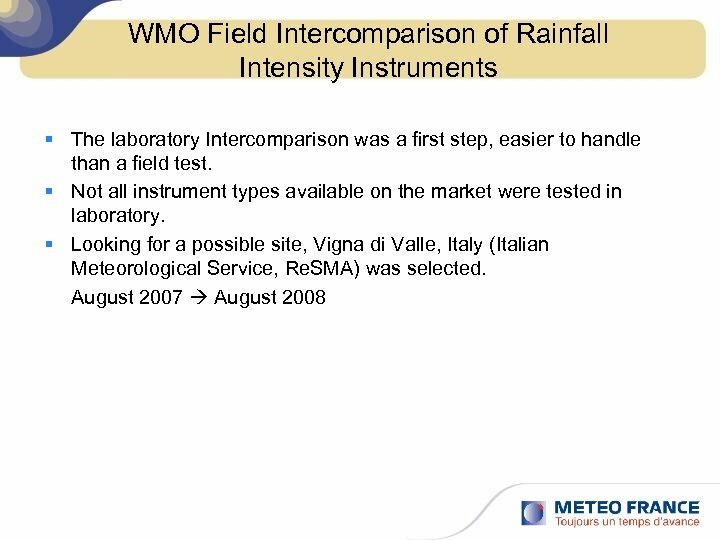 Dual fence rain gauge. 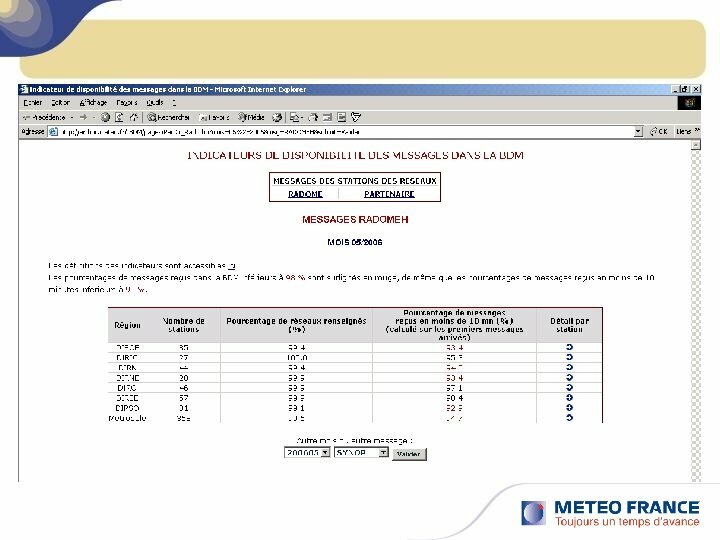 Associated measurement of wind speed. 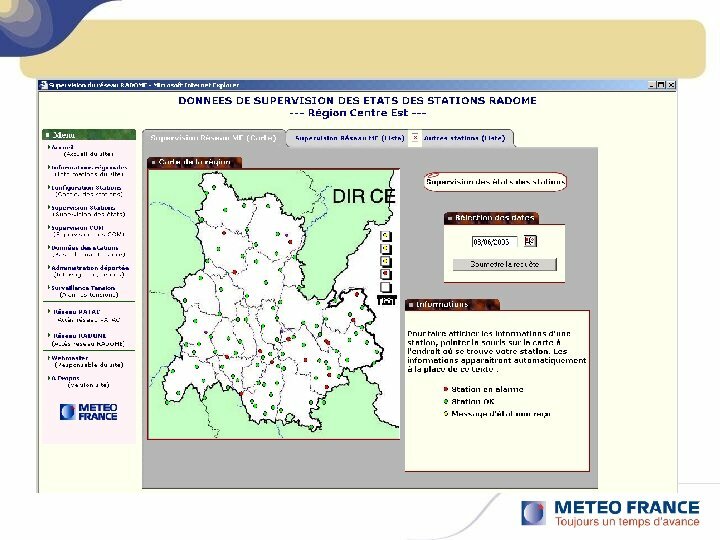 § Such efforts cannot be made in each station of a climatological cooperative network. 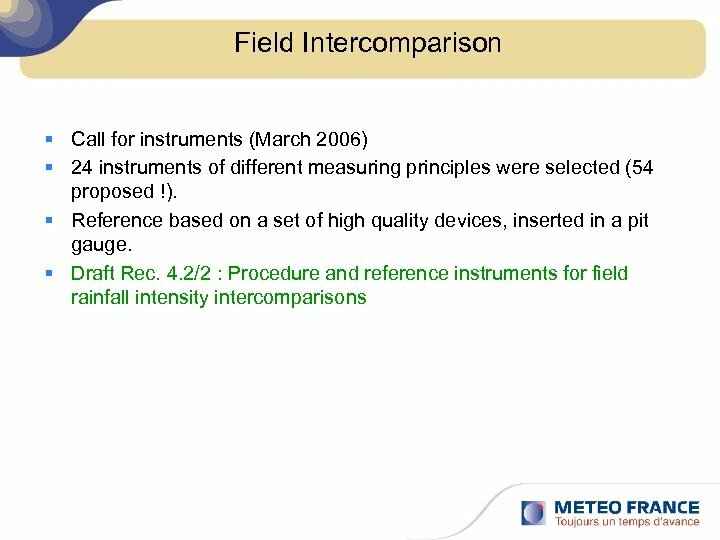 Knowing the characteristics of an instrument § Technological survey : reading publications, participating to conference and instrument exhibitions. 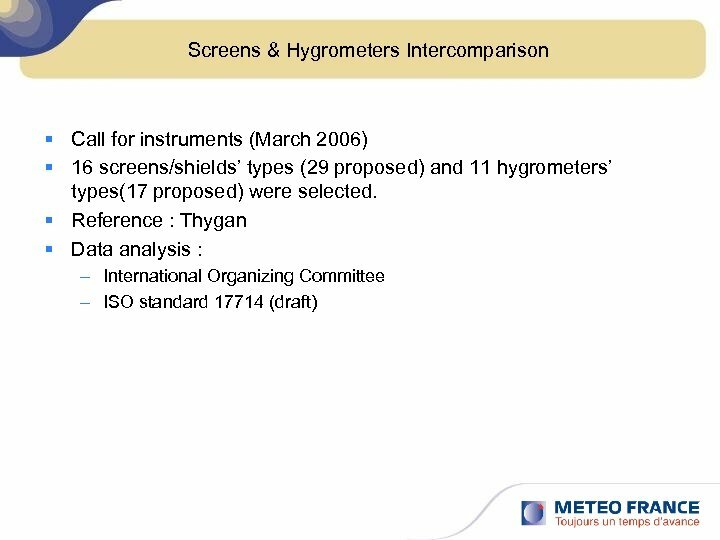 § Testing of instruments : please, publish results and make them available. 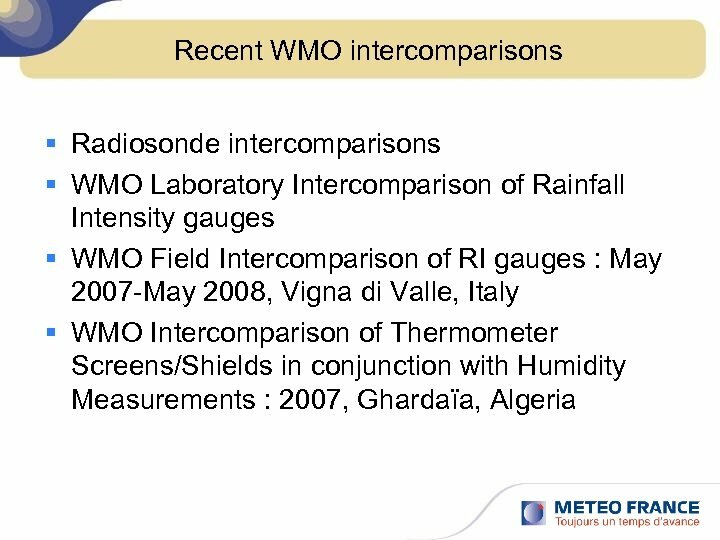 § Intercomparisons, WMO intercomparisons. 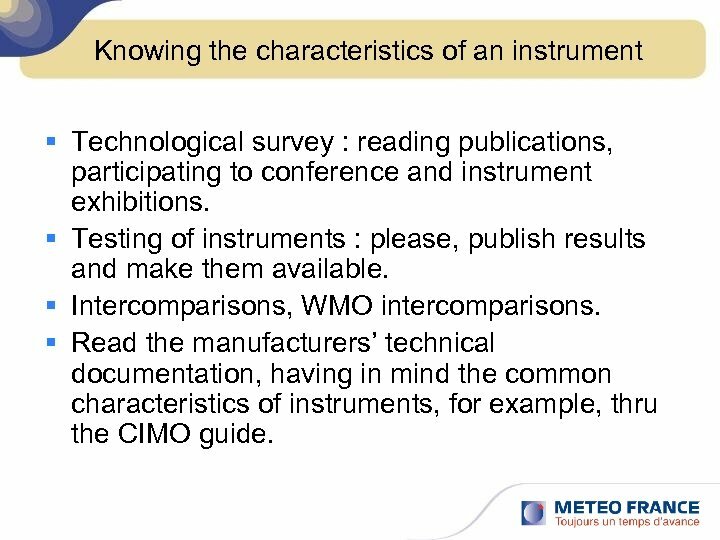 § Read the manufacturers’ technical documentation, having in mind the common characteristics of instruments, for example, thru the CIMO guide. 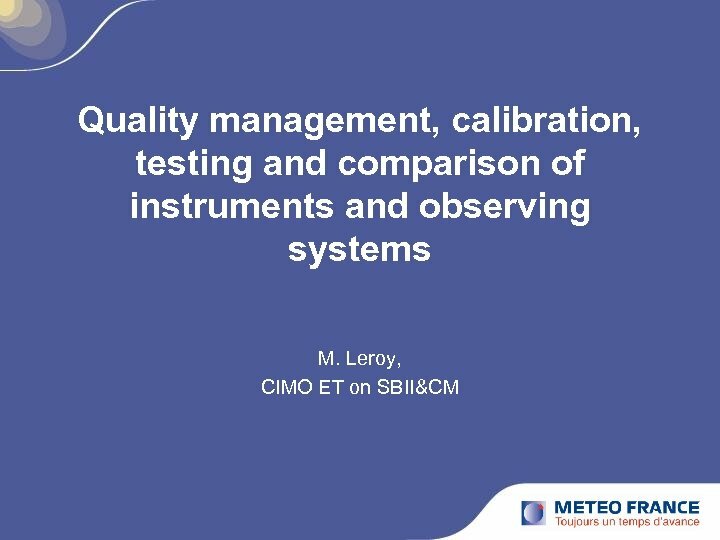 Conclusion § There are many other subjects and actions concerning quality measurement : – Quality control directly at the level of the measurement systems. 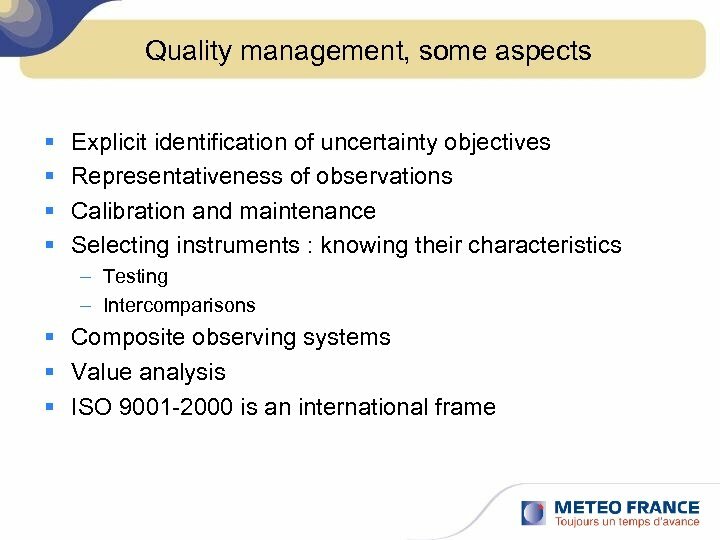 – Quality control using spatial and temporal cross-check. 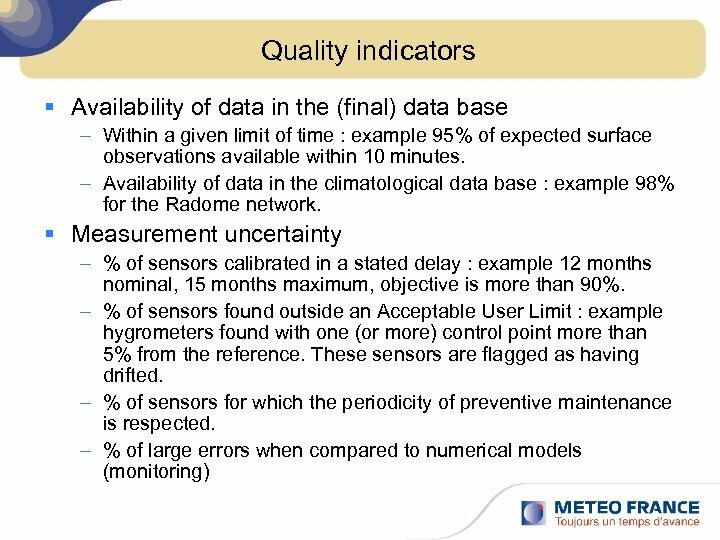 – Representativeness of observations, due to the nearby environment of the measuring site. 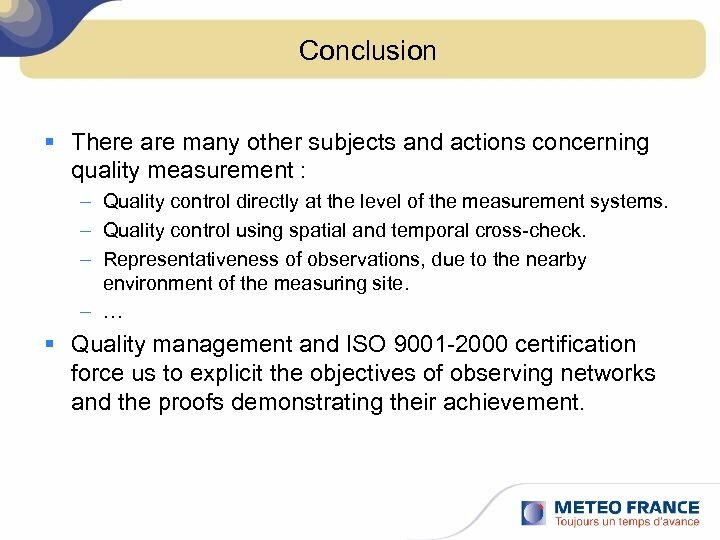 – … § Quality management and ISO 9001 -2000 certification force us to explicit the objectives of observing networks and the proofs demonstrating their achievement.